My assortment of tournament objective markers for Epic Armageddon. I used 60mm diameter plastic bases to mount these. These items only act to mark points in the play area, so the particular size is unimportant — but I did want to keep to a consistent size. And I feel that 60mm is big enough to model something interesting, yet small enough not to dominate the play area or make them too hard to place among terrain items. Rear-left: Water Purification Plant (1/285) (Shapeways) by pfeiffer stylez customizing. Rear-middle: Sci-Fi Fort / Temple (Shapeways) by Scalestuff, plus Armoured Limousine (Vanguard Miniatures) by Onslaught Miniatures. Rear-right: 6mm Eldaritch Summoning Platform (Shapeways) by National Cheese Emporium. Front-left: I got this along with the core of my Imperial Guard army from eBay, already painted (I just fixed it up a bit). It is comprised of a mixture of bits, including the same missile launcher that appears on Guild Cerberus MRL Battery (HLS Models) by Steel Crown Productions. Front-middle: Gothic Bunker (Vanguard Miniatures) by Wasteland Game Studio, on top of some polystyrene I made to look like rock. 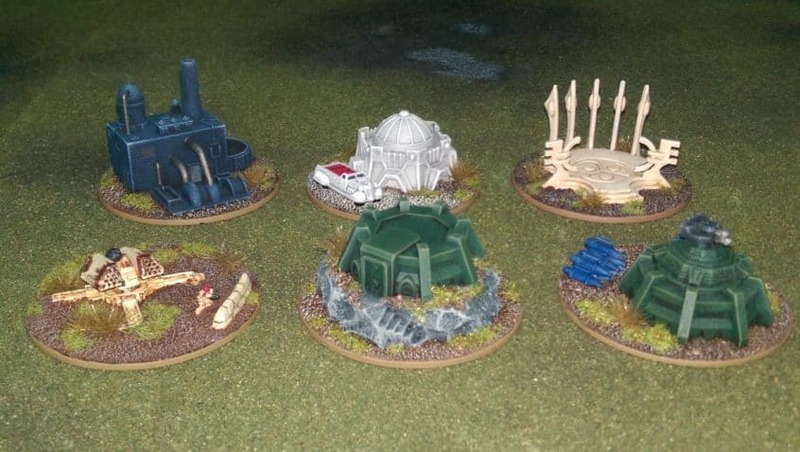 Front-right: Gothic Bunker (Vanguard Miniatures) by Wasteland Game Studio, topped with Skystrike Tower (1/285) (Shapeways) by pfeiffer stylez customizing.